I have not posted in a couple of weeks because blogging is hard to do in the forest. Those who follow me on Twitter or Untappd, will have seen that I was busy. This will be a quick and rambling review of three Phillips beers that I found interesting; Did I just say that? This was a single hop IPA in the Phillips Hop Box - perhaps the greatest bit of marketing I have ever scene. It is too bad you have to drink all those other beers to enjoy the special guest. Both hop heads and beer geeks will enjoy this brew. Yes, these two classes of beer drinkers are different. The hop head will enjoy the gripping spiced orange rind and floral tastes that are amarillo. Beer geeks will enjoy learning this hop flavour profile so they can detect it in other beers. I liked this beer for it's originality and uniqueness. Bonus points for the Phillips boys and girls for trying a new style of beer using locally sourced ingredients. Sadly this beer tasted like unhopped Blue Buck with only a hint of spruce. The spruce did come through with it's characteristic flavours of yellow mustard and table grapes. While these flavours may not sound appealing, in the right balance, spruce produces a stellar beer. The only other spruce beer sampled was Fort George's glorious Spruce Budd Ale. 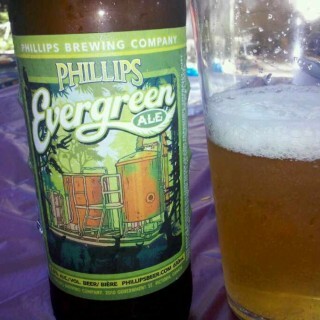 I look forward to sampling the Evergreen Ale if they attempt in again. Why a giant panda spreading fear in a Tokyo cityscape appears on bottle of beer evades me. Perhaps 'panda' is a prefix for the number 11. Nope, that prefix is undec. You can read all about the undecamonium on the Phillips website. Lots of hops and lots of boiling. So how did they do? I am certain to take a lot of heat by saying this; I liked it. This was a vast improvement over the 10th anniversary ale. Despite the fact that the undec was the hoppiest thing ever sampled, it kept drawing me in for another sip. The nose didn't add much: only an unassuming hint of sticky citrus and pine resin. Each heavy, astringent hop slap made this beer almost undrinkable. The hop flavour list is huge: tropical fruit, every citrus, lemons, pine resin, passion fruit and jack fruit. Pick your hop taste and it was there, especially amarillo (see above). This barrage left a dry tongue tingle of alcohol and sweet Drambuie mixed with club soda and honey. Each painful sip revealed further flavour discoveries. I suspect this one will age well, it would benefit with some mellowing of the hops.